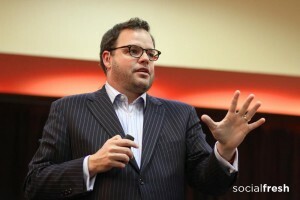 5 Questions with Jay Baer, Marketing Keynote Speaker & Best-Selling Author - Wood Street, Inc. When I read Jay’s book The Now Revolution, co-written with Amber Naslund, something really clicked for me. The web that we’ve been dreaming of was now before us. Businesses now have the opportunity to communicate directly with their clients online – through social channels, blogs, email, etc. The strategies that the successful ones are implementing involve transparency and authenticity. The difference being “newfound customer loyalty and advocacy.” Reading his books, blog or seeing him speak and you get the sense that there is a better way forward. Your latest book, Youtility, is about what Ann Handley would describe as “marketing your clients thank you for.” The idea of utility content is something we’ve written about quite a bit here. If you had to sum up the book in one sentence, what would that be? Everything your business is trying to achieve will occur if you focus on being useful, and you give it time to work. I once watched a video you did (a few years ago) where you discussed real-time the layout of your website with a conversion expert. At the time I thought, “what stones this guy has!” To openly discuss how to make design changes in an effort to get more leads was amazing to me… then. It wasn’t idea of discussing improving conversions, but to do it in front of the audience you’re trying to convert (now it seems like a no brainer). Do you think every business should have this kind of transparency with their marketing? Thanks! That was a video with Derek Halpern, who has gone on to become a big deal over at Social Triggers. Transparency is very much one of the core tenets of Youtility. Check out what Buffer is doing on their blog, publishing the salaries of every employee, real-time revenue tracking, etc. I’m an investor in that company, and couldn’t be more proud of that team. In reality though, most larger companies aren’t culturally ready to embrace true transparency like Buffer has. But at least some translucency would be a good start. Your book with Amber Naslund, The Now Revolution, was a game changer for me. The timing of it was perfect. I suspected for a long time that the concepts you guys were outlining were the way the web was headed but reading it got me into a completely new mindset. If you could rewrite this book today, is there anything you would take out or add in? Thanks for the very kind words. I actually believe The NOW Revolution would be a much more successful book today than it was when we published it in 2011. It was successful then as well, but it was before its time for many businesspeople. Today, I think we’d focus even more on the speed and nimbleness requirements. But most of what’s in the book – especially the part about social media becoming a skill, not a job – are very much coming to pass now. I love your blog Convince and Convert! The thing about how you write is that you don’t mince words; you get right to the point. This is so refreshing. Even the name of the blog is blatantly obvious. Why do you think so many business still struggle with this level of openness? I appreciate that. I would say that while I run Convince & Convert, we have a ton of great writers now, and we’re putting out 8 posts per week. We try to achieve editorial consistency in that we focus on the “and therefore…” approach. We’re not Mashable. You don’t need us for news. Our role is to tell you what it all means, and what you should do about it. And you’re right, most blogs from companies are of lesser value because they are secretly trying to use the blog to sell you something. I suppose we are too, but in a very, very, very indirect way. We see the blog as just one of the ways you can connect with us (email, podcast, ebooks, books, webinars, videos), and that helps us not put too much commercial pressure on it. You are one of the early “Social Media Rock Stars” in the sense that you’ve been talking about using social and tech for marketing since the very early days. Do you think we’re getting to the point where social media isn’t just some novelty? In other words, so many people talk about social media like it’s twerking or whatever the kids are doing now. Isn’t it time we realize that, as Geoff Livingston puts it, social media is just a feature set? As mentioned above, social media will become (and is becoming) a skill more so than a job. The key is to focus on being social, rather than on doing social media. If you think of social as a layer, or like a river that is constantly flowing rather than as a lake you have to go visit, you’ll be much better off. OK, Gini said to ask you why you wear sneakers with suits? Here’s your chance to set the record straight. Ha! I hope there’s a photo with this! 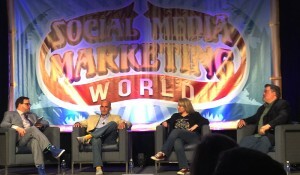 In truth, I’ve only done that ONE TIME, at this year’s Social Media Marketing World event. I moderated a keynote panel with Jeff Rohrs, Nicole Kelly, and Ted Rubin. I knew we would be in low-slung chairs, and Ted is famous for his crazy socks. So, to make sure he didn’t get ALL the instagram photos, I rocked my Adidas Kareem Abdul-Jabbar “The Architect” high tops (NICE! ), which are actually made from architectural blueprint paper. It worked.